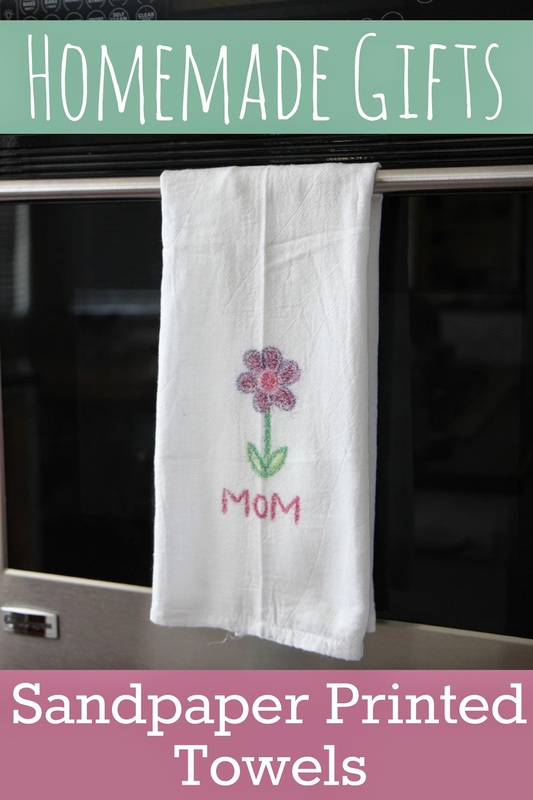 We love finding simple homemade gifts to make for family members, teachers, and friends. A few years ago we made sandpaper printed thank you cards and sandpaper printed t-shirts and they were really fun to make and looked so cute! 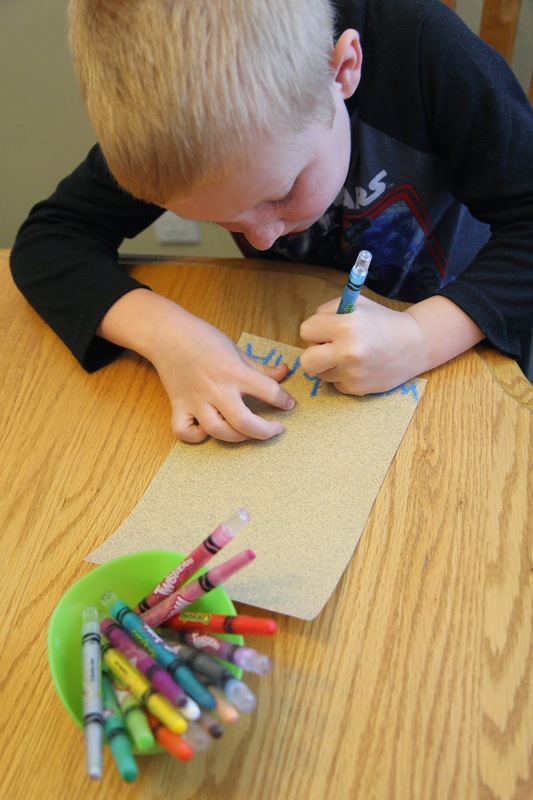 This week we decided to make some sandpaper printed towels. These would be easy to make as gifts for grandparents and teachers or to simply personalize for each member of your family. I love to buy flour sack kitchen towels from Target (REI brand) because they are cheap and work really well to absorb water like towels should... unlike some of the other more expensive towels I have. A few years ago we stopped spending money on paper towels and now instead we have several of these towels that we rotate through. I love them and they are even cuter when they are personalized! We made a few stenciled ones for Earth Day a few years ago and I've been dying to make more. I did this activity with my preschooler and kindergartener. I let my toddler color on the sandpaper with crayons and feel it and play with it... but he wasn't interested in making one. He prefers to eat crayons right now... so he only gets to use them for a few minutes these days. 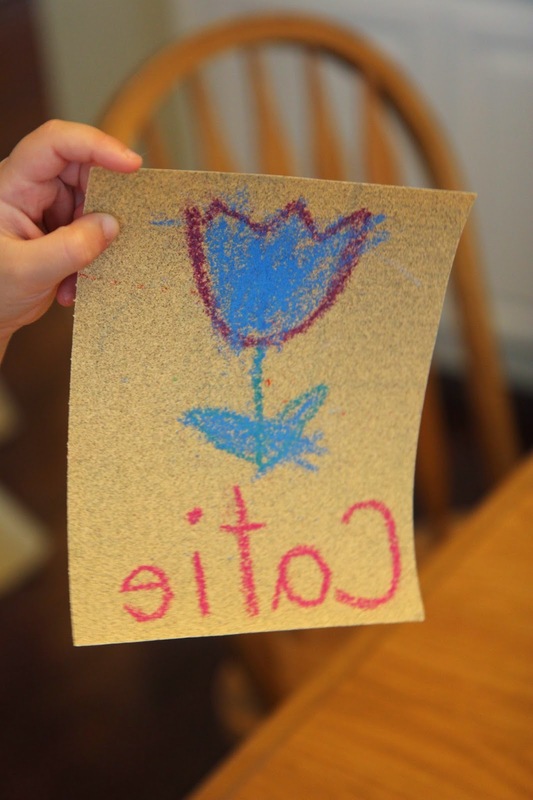 Start off by drawing your picture on sandpaper. Make sure to press hard. This can be hard for littler ones (though is great for building their finger strength). You can always go over the lines for them afterwards. If you are going to write any words make sure that you write them reversed (so they'd look correct if you held them up to a mirror). I wrote out the words reversed on another piece of paper for my kindergartener so that he just had to copy what I wrote. For my preschooler I just wrote he name for her and she picked the color. Next turn the sandpaper upside down and place it onto the towel. 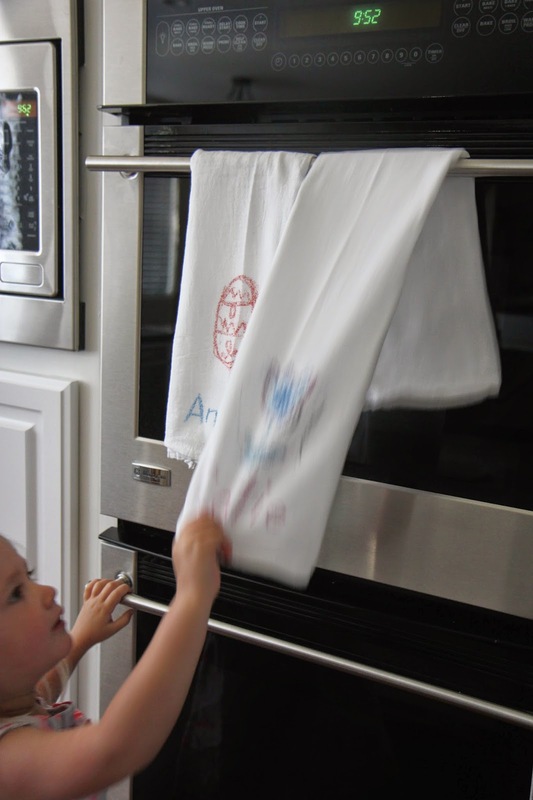 Cover with another thin towel so that you don't get any crayon on your iron. Hold the iron down on top of the sandpaper for 30 seconds using the cotton setting. I moved it around to make sure it covered all parts of the image. Pull the sandpaper off and admire!! I made one first to make sure it would work out ok and then the kids joined in once my sample was done! My biggest mistake was letting the kids see my version. I hate when that happens... so don't do that. It totally squelched their creativity for a bit. 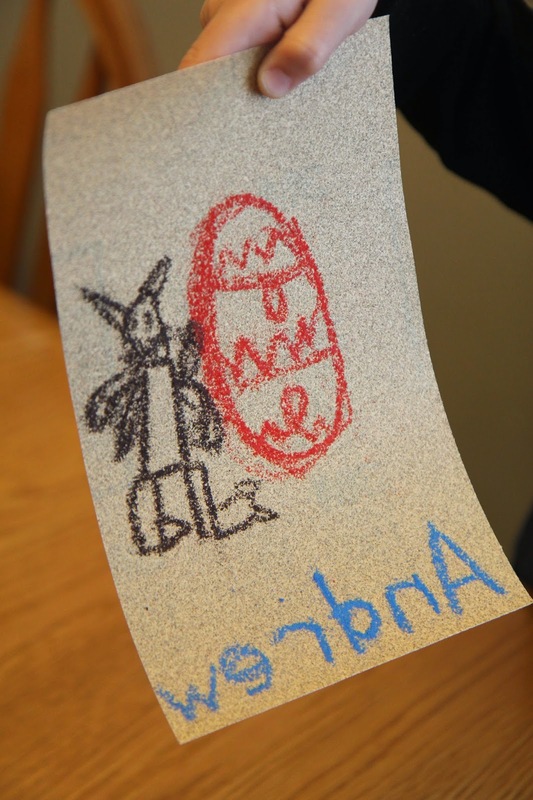 After some coercing I convinced my 6 year old he didn't have to draw a flower like I did and he decided to make a super cool bunny and Easter egg. He decided that it would be awesome to have seasonal towels so he is on a mission to draw one for each holiday now. I was hoping my daughter would make an awesome creation filled with lines and squiggles, but she didn't. She wanted a flower like me too and would not be swayed. She also didn't want to draw it. I relented and drew a flower for her and then let her loose to add details to it. I loved it once she finally started adding her own colors to it to make it more her own. She was loving blue and she really got into the pressing hard part. I wrote her name backwards for her. The towels are now hanging in our kitchen and the kids are so excited to wash and dry their hands now that they have their own personalized towels. In order to set the color on the towels you'll want to cover the imaged with a paper towel and iron a bit of the color off. Then pop them in the dryer for 20-30 minutes to help the color set. We still need to do this with ours before the kids use them... although I think they are going to make that difficult! They are already trying to steal them for drying. Hi Sara- a hair dryer should work as well but I am not sure on how long you'd need to use that. You may want to test it out? Brandee after you follow the instructions for how to set the crayon colors at the bottom of the post you should be able to wash them fine. I would wash them on cold and air dry them to keep the color bright. If you try it a different way and it works though, let me know! What is the best type of towel to use? Does that matter? You always have such cute craft ideas! I'm going to try this with my Activity Day girls. What size sandpaper would you recommend? Whatever size you want to buy is fine. 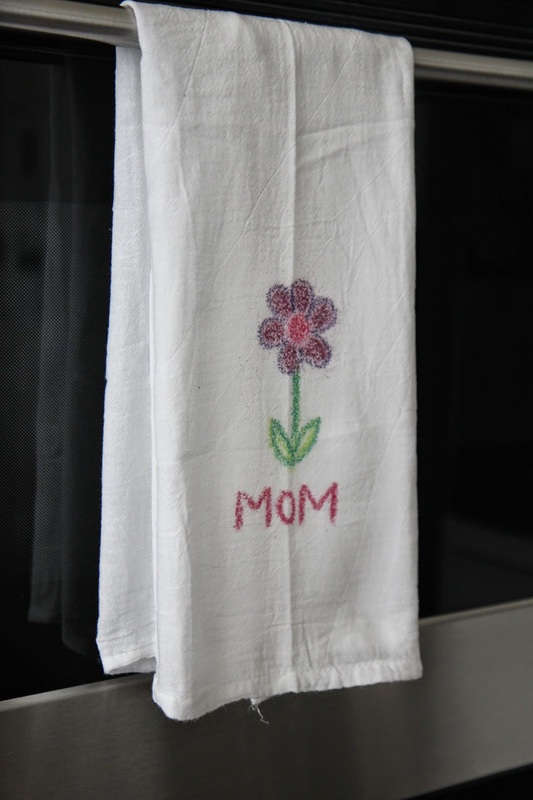 You can cut it down to fit your towel, so it really depends on how much drawing you want your child to do. Definitely make sure you choose a more coarse sandpaper though. So excited to try this with my first graders - we are going to do these for Mother's Day gifts. Wish me luck with 25 kiddos :) Thanks for sharing this fabulous idea! Made these as daycare mothers day gifts and my son made some for his preschool teachers (with some new bath and body hand soap) as their thank you gift. Super cute! Thanks for the great idea! I'm going to give this a try for the Grandparents Christmas gift. We have plenty of time to practice! Hey Kristina! Thanks for the amazing idea! 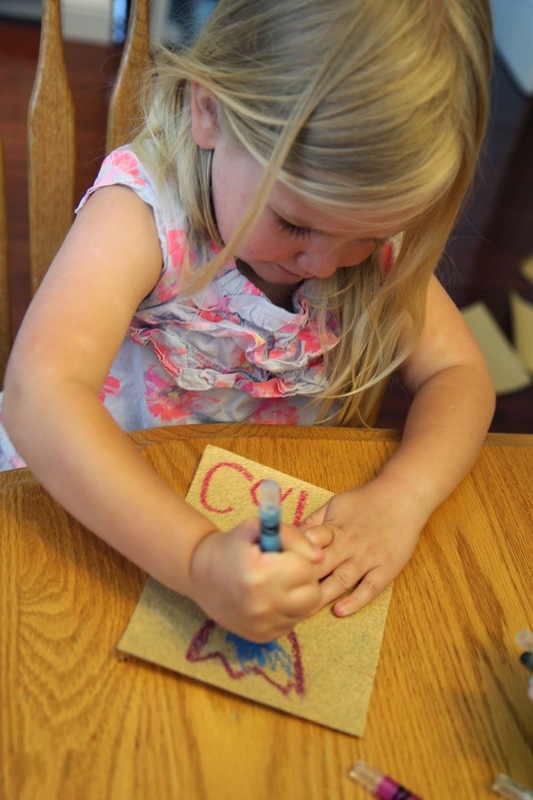 What coarseness number of sandpaper did you use? Would 100 work or should it be even more coarse than that? Thanks! Any level of coarseness will work. I think the coarser the better though.